In case anyone was suspicious I was over-exaggerating the state of our current sugar-addiction epidemic, I would like to point out some key items from the last day of school. We especially loved Greta’s fifth grade teacher this year: Mrs. Roberts. Mrs. Roberts is the kind of teacher who seems to take each student under her wing in some protective, affectionate, almost aunt-like or grandmotherly way. To celebrate the end of the annual school-wide reading program, she invited the entire fifth grade over to her house for movies, a picnic and swimming. I mean, can I retake fifth grade but have Mrs. Roberts this time? Like any treasured aunt or beloved grandmother, Mrs. Roberts does give the kids treats- hot chocolate in the winter, candy at Halloween, Skittles if a kid is having a particularly hard day, and Twizzlers on the last day of school. But what astounded me on the last day of school wasn’t the fact that Mrs. Roberts’ had given out Twizzlers, but rather the Hershey Company’s savvy marketing of Twizzlers as a way to practice fractions. Yes, in fact, there was a whole book about it, which Mrs. Roberts was kind enough to let me photograph in my astonishment. 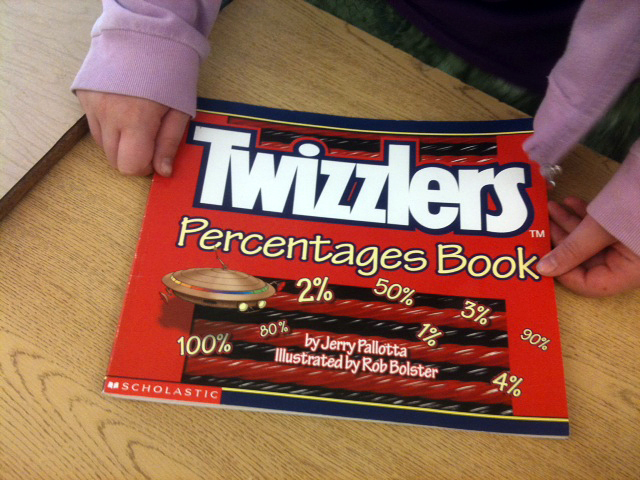 My understanding is that the book-directed exercise went something like this: if you have ten Twizzlers, and you eat three of them, what fraction represents the amount of Twizzlers you have left? Voila! Twizzler math. Exhibit B: The PTO picnic. Actually, we did fairly well at the Last Day of School Picnic. Every year each grade is assigned a food to bring, while the PTO provides volunteers and the hot dogs. In addition to the dogs (probably okay, but being strict hold the bun), there were chips (go for the Smartfood, skip the Sun Chips and Doritos), macaroni salads (skip these- mayo has sugar) tossed salads, watermelon and chopped veggies (yay!). All in all, not a communal meal in which we need fear starving to death. Of course, there was dessert, and I had the watermelon while my kids opted for the little paper cups of ice cream, but I did manage to steer them away from the lemonade and in the direction of water or milk, so I figured we had done okay. But a funny thing happened. In addition to my green salad contribution I brought along a bottle of my homemade lemon juice and olive oil salad dressing, mainly for our family’s benefit. I placed the bottle on the table with a whole regiment of other bottles, every other one of which had come from the store. Here’s where it gets interesting. As I helped one of my daughters add items to her plate, one of the volunteers was asking kids what kind of dressing they wanted to dip veggies in. Did they want Ranch? Thousand Island? Blue Cheese? Then she came to my bottle, picked it up and paused, eyeing it with suspicion. “I don’t know what this is.” she said, dismissively. I could have pointed out that “this” was homemade, whereas all other options were store-bought. I could have mentioned that “this” had four ingredients, whereas all other options had about forty. I could have mentioned that, of all the bottles on the table, “this” was the only one without any unpronounceable or unfamiliar ingredients, including stabilizers (plastic on your salad anyone?) MSG (check your Ranch!) or (need I even say it?) sugar. But I didn’t. Instead I just felt keenly how topsy turvy things have gotten when we are suspicious of foods for not being processed or manufactured enough. When we got home from the festivities that afternoon I literally poured our kids back-packs out on the floor- papers, workbooks, projects, bottom of the desk dregs, and art class masterpieces were everywhere. No to mention flyers advertising summer library programs, suggesting summer projects and the Mother Myrick’s Summer Reading Program Sheet… I saw that last one and my heart sank. It sank because we’ve done the Mother Myrick’s Reading Program for the last few years; Mother Myrick’s is a nearby bakery and confectioner of some renown, and they offer special prizes to kids who bring in lists of the books they’ve been reading over the summer. It’s a great idea. It’s also very generous. It’s also a whole freakin lot of candy. For every two books a kid reads there is a corresponding bag of candy and maybe some plastic toys or stickers. Last year we actually made it to all five levels and Greta was up to her eyeballs in chocolate-this and gummi-that. It was a little overwhelming, but who was I to question the rules of the Summer Reading “game”? However, this year I’m the Sugar Nazi, and the Sugar Nazi questions bloody everything. I was in a bit of despair about having to sacrifice yet one more fun thing to the Gods of No Sugar, but I smiled and proposed an alternative to the kids: how about we make up our own Summer Reading Program? Within minutes, Greta and Ilsa had found a large sheet of paper and were brainstorming prizes: how about berry picking? We could get a book at the bookstore… Swimming! No wait- bowling! Ooo! How about… going to the amusement park!? They were giggling and squealing over the endless possibilities. All at once I was relieved, impressed and kind of humbled too. Look at them go, I thought, they’re taking on the challenge of retooling their world, their habits, their rewards system- they’re excited about it! We grown ups, I think- so often stuck in our store-bought salad-dressing ruts- would do well to take a page from their book. Let the summer reading begin. I don’t think Mr. Major was the source of your interest in the sugar project but I DO think he should have been fired! Did I know about this? Oh yes, have fun with the summer reading project. Dear Eve, we are just launching ( umm launching would be the wrong word.. ..shelpping… ..yes..much better) into our world of tossing the sugar but wanted to comment on your expereince with school. Luckily I have avoided the issues that come with school and food by homeschooling my kids for the last 20 years but I see it in my local schools and with friends kids.. so difficult to avoid that is for sure! Good for you mama finding ways to avoid the posion without avoiding the fun! I don’t know how you do it. I don’t have a no sugar rule per say, but am still shocked? annoyed? by the constant bombardment of sugar for my child. And I feel like evil mom for saying, “No popsicles, juice, cake, raisins… for her. No, thank you”. And having the other moms look at me like I’m depriving her. She has had all those things but I just try to limit her exposure and def not on a daily or even wkly basis but when you work and have to rely on outside help, it’s hard. Esp when they have kids and do give their own children all the above plus “treats”. I do give her her own food but of course it’s not cute or has cuddly charactors on it. Keep up the good work. Keep the home fires burning bright!! Eve, I have been avidly following your posts. I have reduced my sugar consumption and my goal is to follow your path. I did go vegan in January, so that in itself is an adventure for a cheese lover! Quick comments: My son used the M&M counting book in kindergarten, in 1993. I was stunned at the clever marketing tool. The teacher also used Teddy Grahams regularly for math assignments. Great thoughts on the salad dressings, but why not carry it a step further by making a home made sign w a catchy name: “Easy- Peasy-Lemon-Squeezy Vinaigrette” or something along those lines, and then listing the ingredients. I am a cautious experimenter in the food dept when I am unsure of the ingredients; your dressing COULD have had anchovies in it! 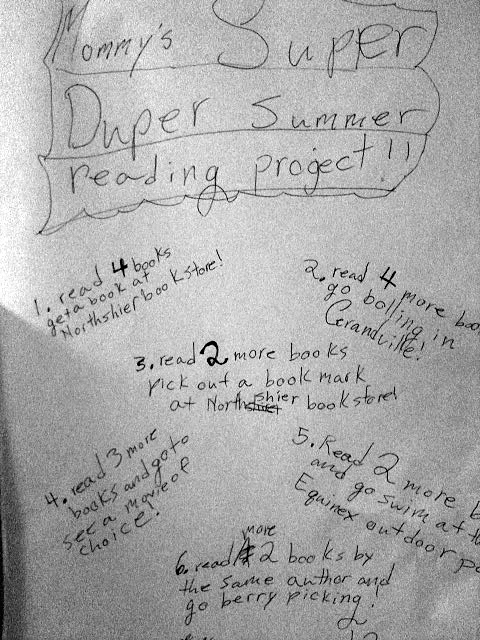 LOVED your idea for a summer reading program! Our school traded ice cream coupons. I never considered designing my own. You are currently reading A Year Of No Sugar: Post 58 at Eve O. Schaub.